No chance of this brook babbling...looks more like a sewage outlet!! This is typical why we have floods, this stream needs clearing out so the water flows more freely. A nice natural piccy. It's the natural peat colour. The water in one of my least used toilets goes that colour if left unflushed for any length of time, as does any sponge if left wet. Pity we can`t hear the birdsong David !! Black high-legged boots shone like the sun. yet his beard was white, looking ever so old. His hands were so tiny, fingers so small. But then, you see, he was just two feet tall. but how can YOU say that it isn’t true? Was it a green hat, or copper gold head? are able to see such a wonderful sight. It is only ochery, iron oxides from the soil, nothing wrong with it. 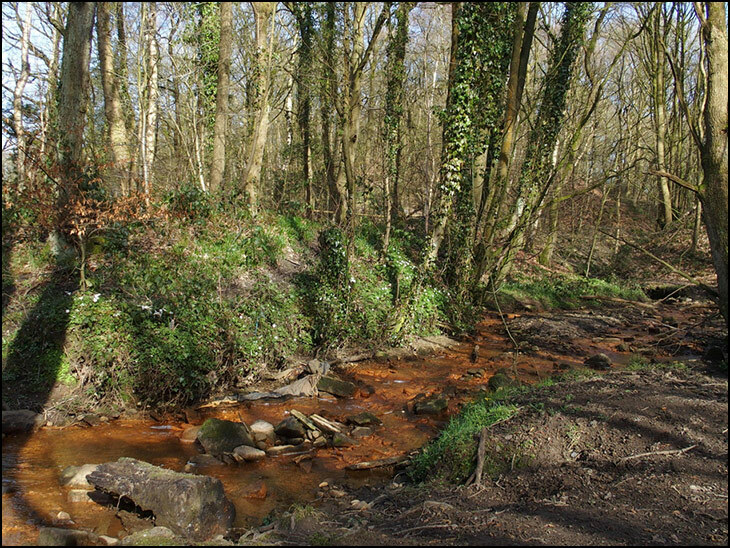 Streams sometimes run that colour in areas where there is iron ore in the local geology. Nice play of colours and shadows. As Jonno says it's only ochery water, same as the Yellow Brook used to be. Ernest you can hear the birds on this video. Thanks, Mick. Have enjoyed your NZ video`s. I saw a pod of dolphins as well as fur seals in Milford Sound and there was snow outside Homer Tunnel in April 1996.